Get ready for some good old arcade action because one day before Mario Kart 8 Deluxe makes its way to the Nintendo Switch, KAMIKO sees its Western release and it is one arcade looking game you won’t want to miss! Having already been available in Japan for the Nintendo Switch, there’s a good chance some of you have already seen footage of the game in action, or have seen a picture or two. Well what you see is what you get, and it’s actually a pretty good game if I’m being honest. Yes it is short, I’m not going to deny that fact, but it is good nonetheless and because I don’t want to reveal how short it is just yet, I’m just going to get on with the review and save that tidbit nearer to the end. To my knowledge, the best way to summarise KAMIKO is to say it is very much so early Zelda-esque styled game. It’s not as difficult, or as captivating, but it is an attractive game, one with many puzzles that you would often find in a Zelda game and for some strange reason, at this moment in time, I just can’t get enough of it. But since saying it is like Zelda is a little vague, I best go into more detail. Firstly let’s begin with what is a KAMIKO. Whilst it is the name of the game, it is also the term given to the one who can vanquish the Demons and restore peace to all dimensions and this if you can’t guess, does in fact have something to do with the game’s story. So what is the story? Well just as soon as the player creates a new game they can choose one of three playable characters and just as soon as they’ve made their choice, the game begins with your chosen Shrine Maiden/Child of the Transient World, called to the Realm of the Dead, where you learn of something terrible. Demons have taken over the gates (aka Toriis) that connects the Realms (of the Dead and the Living) and have placed a seal on them. If those seals are not broken, the Demons will take over the Realm of the living and lead Humanity down the path of destruction. As the most powerful of all Shrine Maidens, it is your duty to become the KAMIKO and prevent the impending disaster, but so you don’t go empty handed, a weapon is bestowed upon you. Now as for the levels, beating them is relatively simple. Each stage, which is accompanied by a very good soundtrack comprised of retro-inspired chiptunes, has four Toriis that need to be freed before the player can advance to a “central area” where four statues are gathered and be whisked away to a location that leads you to where a Boss battle takes place and yes every Stage ends with a Boss Battle and they are very much so traditional Zelda! To players frustration though, just as soon as you complete one Stage, you will be shown how long it took you to complete the Stage before throwing you into the next one and while you can’t see why that would be frustrating, it is when it only took you 15 minutes to clear the first Stage and there are 4 Stages in all. Yes KAMIKO is a game with very little content with regards to levels, but the levels it does have are enjoyable, have great visuals at all time, there’s three different ways to play due to the three different characters, but it is also perfect for speedrunners. Granted not everyone is a speedrunner, but for those who are, this game is perfect for you and it’s perfect for non-speedrunners as well. Why? Well while some may deem KAMIKO a terrible game because it is a game they could complete from start to finish in under an hour, it is actually a game you can enjoy playing for hours on end and walk away with the feeling of satisfaction due to accomplishing something. So yeah, while content wise, it is a very small game, and the epilogue is a bit iffy with some odd choice of dialogue for the final battle, it is still a great game with lots of replay value and every second of it really is just entertaining gameplay and I can honestly say, I thoroughly enjoy KAMIKO now as I did when I received the review copy a couple of days ago. Furthermore, it’s actually one of the first indie Switch games to actually use its own personal #KAMIKO hashtag when sharing screenshots to Twitter and that is pretty awesome to see since tons of larger indie and 3rd party games don’t! Short or not, like I said, it has plenty of replay value and it is something you absolutely can pick up and leave whenever you want, and you know, it’s got a good touch of the Zelda! Also it is not going to break the bank, it’s only $4.99, which I feel should have been more, but players of all ages are bound to enjoy it. So for those reasons I’m giving it an 8/10. I know what you’re thinking, “how can he give the game high praise and then a score such as that, when it should clearly be a 9?” Well I hate to score it as 8, but it has to be done. KAMIKO is a good game and the only thing that really lets it down, is the small number of levels. I like what has been created here, the world, the characters and I would like to see more of it. To have more content, but that’s probably not going to happen and that’s okay, as long as KAMIKO is revisited at some point and more is done with it. Maybe a patch that includes a harder difficulty, a free piece of dlc that includes one extra stage or even a sequel! The fact of the matter is KAMIKO is a good game, but perhaps too good for a game of its size, as the lesser content did have a big impact on the final score. 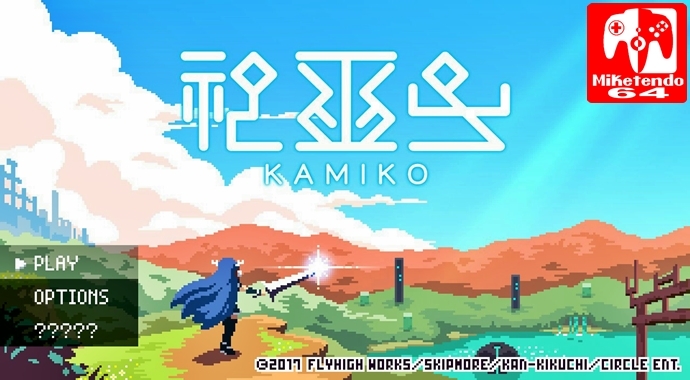 Regardless of all that though, I most definitely would recommend KAMIKO to any and all Switch owners who are willing to give it a go, especially since it’s a great little package created by a one-man studio! I think an under-an-hour game with replayability is perfectly acceptable for $5. People forget that development takes tons of time and money, even for a short game like this. It looks cool and I’ll definitely check it out, especially with the low cost of entry.